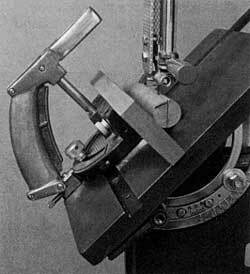 The bandsaw gets its name from the continuous loop or "band" formed by the flexible steel blade. This blade cuts with a downward motion, toward the table. Because it cuts continuously, you'll find the bandsaw is one of the fastest cutting tools in your shop. 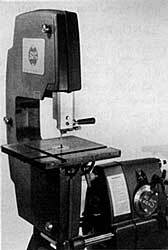 The bandsaw will perform a wide variety of workshop operations. The two most common uses are cutting curves or irregular shapes in wood and resawing (slicing thin boards from thick ones). But you can also make crosscuts, rips, bevels, miters, compound curves, duplicate parts, and many other special cuts. You can also cut materials other than wood. With the proper blade installed, the bandsaw will cut plastic, plastic laminates, particle board, and even soft, nonferrous metals such as copper, brass, and aluminum. Figure 14-1. 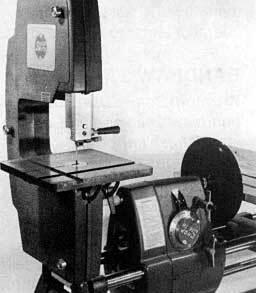 The Bandsaw can be mounted on (A) the MARK V or (B) on a Shopsmith Power Stand. To set up your bandsaw, follow the instructions in the Owners Manual that came with your bandsaw. The bandsaw can be mounted on the Mark V or a Shopsmith Power Stand (Figure 14-1). The cutoff capacity is 10-1/2"
-the distance across the machine's throat. However, with the blade offset 30� right, you can cut off (freehand) any length of stock up to 3-7/8" wide. The bandsaw will cut stock up to 6" thick. 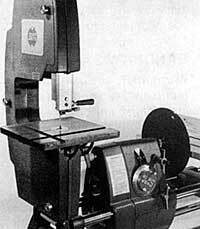 The bandsaw accepts continuous-loop blades 72" long and 1/16" to 5/8" wide. Bandsaw blades are mounted on two wheels, 11" in diameter. Both wheels are covered with rubber tires to protect the teeth of the blades and provide traction. The idler (upper) wheel revolves on needle bearings, while the drive (lower) wheel revolves on sealed ball bearings. The blades are tensioned by adjusting the position of the idler wheel. The table surface is 11-3/4" (front to back) by 12" (right to left). The table can be tilted from "0" to 45� right (away from the frame). It has an adjustable positive stop at "0." If this stop is removed, it can be tilted an additional 5� left. Figure 14-2. 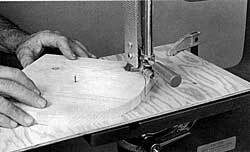 The bandsaw/disc sander is a logical dual-purpose setup, but the speeds used must be that of the bandsaw, not the disc sander. The bandsaw mounts on the power mount end of the Mark V. Warning: You can run the bandsaw together with a disc or drum sander (Figure 14-2) as long as you remember that the dual setup must run at bandsaw speeds. You can supply extra support for long stock by setting up the Mark V worktable and the rip fence as shown in Figure 14-3. Since the carriage can be positioned anywhere between the power plant and the end of the machine, you can adjust to supply support where it is most needed. Figure 14-3. You can get extra support for long workpieces by using the MARK V worktable and rip fence this way. Wider blades are stiffer, so the cut is straighter. Larger teeth and deeper gullets help clear the sawdust in a deep cut. Wider blades are the best choice for heavy resawing or sawing thick stock. Narrower blades are better suited for intricate work. The narrower the blade is, the tighter the radius it will cut. Choose narrow blades when you need to cut complex designs. To help select the blade that will work best for any given operation, refer to Table 14-1. 1/16" Woodcutting Blade* - 24 teeth per inch, 1/32" minimum turning radius For extremely fine detail work only. Use for wood and plywood up to 3" thick. Not for heavy-duty cuts or resawing. Note: Set the tension scale at 1/8" setting. A (750 RPM, 2160 FPR) for hardwood. B (850 RPM, 2450 FPM) for softwood. 1/4" Combination Blade - 6 teeth per inch, 3/4" minimum turning radius A good general purpose blade for wood, plywood, plastics, particle board, and soft non-ferrous metals. Limit resawing to stock 4" thick, metalwork to stock 1/4" thick. This is the blade that comes with your bandsaw. B (850 RPM, 2450 FPM) for hardwood. C (950 RPM, 2750 FPM) for softwood. Slow (700 RPM, 2000 FPM) for other materials. 1/2" Combination Blade - 4 teeth per inch, 2" minimum turning radius For heavy-duty cutting fo wood, plywood, plastics, particle board, and soft, non-ferrous metals. Suitable for resawing stock up to 6" thick, and metalwork in stock up to 1/2" thick. Slow (700 RPM, 2000 FPM) for hardwood, softwood, and other materials. Several blade manufacturers make bandsaw blade stock for a variety of special purposes -- intricate scrollwork, cutting iron pipe, etc. If you need a special blade, you can have it made at a well-equipped commercial saw shop. Use only high-quality blade stock 1/16" - 1/2" wide. Be sure that the finished blade is 72" long, plus or minus 1/2" and that the weld is ground perfectly smooth. *Caution: Do not use 1/16" blade without special guide blocks. 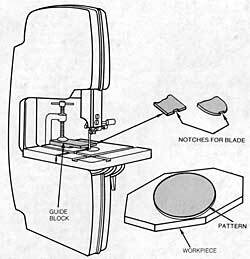 Failure to use special guide blocks will ruin the blade and damage the standard guide blocks. **Note: these speeds are for 60 hz. operations. Danger Zone-The bandsaw danger zone is 3" out from the blade in all directions. Use a push stick whenever you need to maneuver a workpiece inside the danger zone. This safety device helps protect your hands and fingers. A push stick also gives you better control when you're working near the blade. Always replace the cover on your bandsaw before you turn it on--never operate the machine without the protective cover. And remember there is a blade guard attached to the upper blade guide. This guard automatically covers the unused portion of the blade when the guides are adjusted properly. Always adjust the upper blade guides to a maximum of 1/4" above the stock. Not only is this safer; it gives the blade better support. Wear proper eye and ear protection and a dust mask. Do not remove stock or scraps until the blade has stopped. Maintain proper adjustment of blade tension, blade guides and bearings. Keep the upper guide adjusted to a maximum of 1/4" above the stock. Never reach close to the blade or under the table while the machine is running. Hold stock firmly against the table. Never attempt a turn tighter than the blade will allow. Otherwise, the blade might break or jam. Use a push stick to finish a resawing or ripping cut. Hold round stock in a V-block. If the blade breaks, turn off the machine and stand away until it stops. Whenever you mount and operate the bandsaw on the Mark V, secure the accessory mount lock, power plant lock and the bandsaw mounting tubes. Never turn on the machine with stock pressed against the blade. If you hear a ticking sound or unusual noise, stop the bandsaw immediately. A ticking sound often means a damaged blade. If you're using a Shopsmith Power Stand, be sure you're using the proper pulley and belt combination and that the pulley and belt are properly guarded. Before you begin any bandsaw operation, turn on the Mark V, set the speed according to Table 14-1, and let the bandsaw come up to speed. 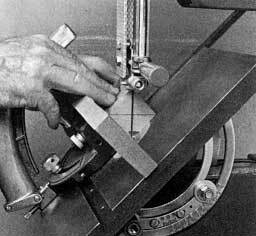 The speed of a bandsaw is measured by how fast the blade travels, or "Feet Per Minute (FPM)." The speed is determined by the blade and the material. Generally, slow speeds are used with wide blades to cut hard, thick woods and dense materials. High speeds are used with narrow blades in soft materials. Figure 14-4. Adjust the upper blade guide so that it's a maximum of 1/4" above the workpiece. Adjust the height of the upper blade guide so that it's no more than 1/4" above the work (Figure 14-4). Then think through the cut before you turn on the machine. Know where you'll put your hands as you feed the stock into the blade; make sure the stock won't be blocked by the bandsaw frame (Figure 14-5). When you're satisfied that you can make the cut safely and without interference, turn on the power, set the speed dial to the proper speed and wait until the machine comes up to speed. Figure 14-5. (A) Visualize the cut before you begin and you can avoid the kind of throat interference that is occurring here. (B) Started this way, the cut can be made in one continuous pass. Take a comfortable stance in front and slightly to the left of the blade, and start your cut. As you work, you may shift more toward the center. Warning: Stand on the left side of the blade. If the blade breaks it may fly to the right. Slowly feed the stock into the blade. Use both hands to guide the stock and keep it pressed firmly down against the table. Don't force the work, but you can feed fairly rapidly since the machine cuts quickly. It's alright to pause in the cut for a moment, but try not to remain stationary for too long. The blade will heat up in the kerf, burning both the stock and the blade. Feed the stock directly against the teeth, even when cutting curves. To determine if the blade is the right size for the curve, refer to Table 14-1. If the blade continually wanders off the pattern, there are several possible causes: The blade guides may be improperly adjusted. Or you could be pressing against the side of the blade. You may also be trying to cut a curve that's too tight for the blade. If the blade wanders or "leads" just to one side or the other, the teeth are improperly set. 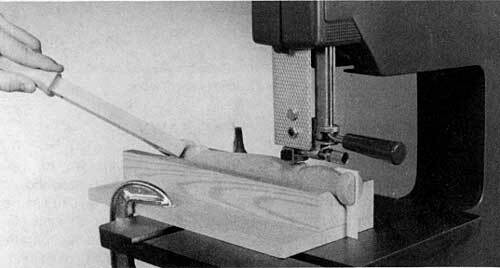 To correct the set of the teeth, refer to the Bandsaw Owners Manual. If the machine bogs down, stop a moment to let the bandsaw catch up. Check to see if the blade is twisting in the guides. If it is, you may be pressing against the side of the blade or trying to turn a corner too tight for the blade. If the guides, you're probably feeding the stock too fast. Once the bandsaw is back up to running speed, feed the stock a little slower. If the problem persists, check the blade to see if it's worn. Replace dull or worn blades immediately. If the blade jams on a scrap, turn off the machine and unplug the power before you attempt to clear the scrap. If the blade breaks, move around to the left side of the machine and turn off the power. Wait until the wheels come to a complete stop before removing the cover and the broken blade. Cutting Outside the Pattern Line-For precision work, cut slightly outside the line--in the waste stock--then sand to the final dimension with a disc sander, belt sander, strip sander or drum sander. Not only does this technique make it easier to be accurate, the finished edge is smoother. The mill marks left by the bandsaw are removed when you sand up to the line. Figure 14-6. Break complicated cuts up into simple curves and lines. Breaking Up a Cut-Break complicated cuts up into simple curves and lines. Study your pat-tern to see how you might cut it in several easy passes. Don't be afraid to cut into the waste stock and loop around in order to reposition the blade at a better angle to the pattern line (Figure 14-6). Figure 14-7. You may have to backtract with the blade in order to cut some patterns. Plan ahead and avoid backing out of cuts. 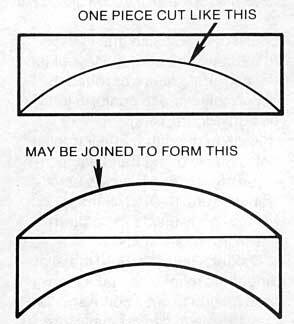 Backtracking-In order to break up intricate patterns into simple cuts, you may have to cut in to a point, then back the blade out and cut from another angle (Figure 14-7). This is a safe technique if done carefully, but there is always a danger that you may bind the blade, pull it out of the guides and off the wheels. Sawdust can also build up behind the blade, preventing you from backing it out. To backtrack out of a cut longer than 1", turn off the machine and let it come to a complete stop before backtracking. If you can, avoid backtracking in long cuts altogether. Figure 14-8. 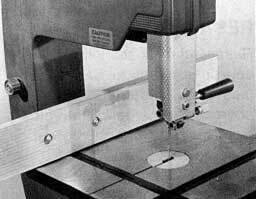 Round or square relief openings can facilitate making internal cuts. When possible, plan the openings as part of the design. 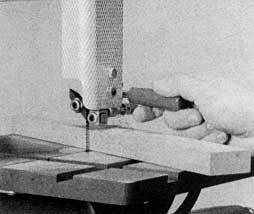 Drilling Relief Openings-A few well-placed relief openings will give you sufficient turning room to make tight cuts. Square-cornered relief openings can be formed with mortising bits and chisels; round holes, made with drill bits, can be used when the blade can't turn the radius required. Sometimes, corner holes are used just to make bandsaw cutting easier; the radius of the corner is exactly right because of the bit size that is used. In all cases, be sure the layout for the corners, square or round, is accurately done to conform to the design (Figure 14-8). Figure 14-9. Relief openings give you turning room to cut tight internal corners. Click on image for larger view. 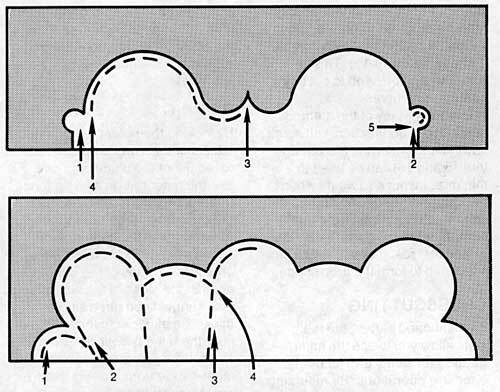 Keep in mind that making relief holes is one of the handiest techniques for cutting intricate scrollwork (Figure 14-9). Drill these holes slightly inside the pattern line in the waste stock. Making Relief Cuts-Radial or tangential relief cuts make it possible for you to cut a curve smaller than the blade can normally turn. Make radial cuts toward the pattern line and backtrack out (Figure 14-10). Then cut the desired curve. As the blade meets up with each radial cut, a little piece of waste stock will fall away. This, in turn, provides more room for the blade to turn. Figure 14-10. To cut tight external curves, make several radial cuts before you cut the pattern line. Figure 14-11. You can aslo cut tight external curves by making a series of tangential cuts as shown. 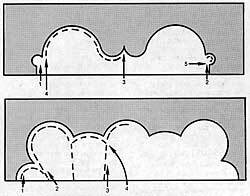 Make tangential cuts by cutting on the pattern line until the blade starts to bind slightly, then run off at a tangent to the curve. Cut completely through the waste stock to the edge of the workpiece, removing a small amount of stock. Start cutting the pattern line again where you ran off at a tangent (Figure 14-11). Repeat this process until you've cut the desired curve. Remember that radial cuts are useful when cutting both internal and external curves. 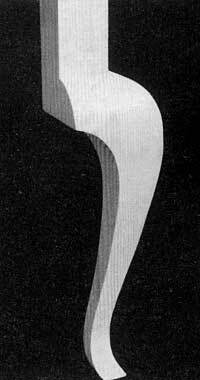 Tangential cuts can only be used on external curves. Figure 14-12. To cut corners and curves in tight spots, feed the workpiece very lightly agains the blade and let the teeth nibble away. "Nibbling"-There are times when you'll need to cut a detail in a pattern that's too small to use any of the techniques described previously. For these extra-fine jobs, feed the stock very, lightly against the blade and let the teeth "nibble" it away (Figure 14-12). This is handy when you need to cut tiny corners and curves. Figure 14-13. 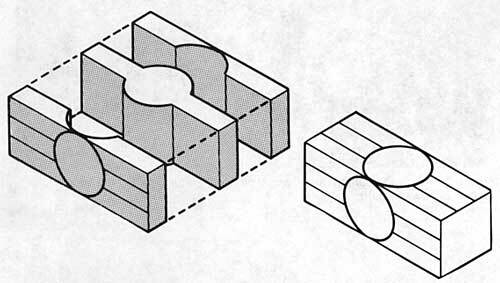 Wise planning of the layout can often make it possible to join pieces to form a particular shape. It is also a way to economize with material. 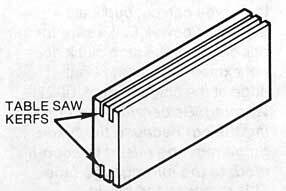 Layout-Many of the methods described in connection with scroll sawing and jigsawing can be used to minimize layout and waste when bandsawing. A specific application, which is typical, is the forming of acurved rail (Figure 14-13). 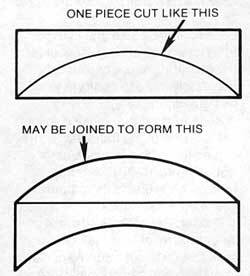 Two pieces that result from a single cut are joined to form the arch shape. Figure 14-14. 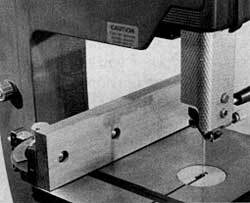 By mounting the miter gauge in the table slot that runs parallel to the flat of the blade, you can crosscut and miter. As mentioned earlier, the table slots allow you to use the miter gauge with safety grip for many bandsaw operations. By mounting the miter gauge in the slot that's parallel to the flat of the blade, you can make crosscuts and miter cuts similar to the cuts made on a table saw (Figure 14-14). Your cut-off capacity, however, is limited to 10-1/2 ". Any longer than that and the stock will strike the bandsaw frame. To increase the cutoff capacity when crosscutting, you can offset the blade. When the blade is off-set, you can cut off any length of stock that you can safely handle, as long as the stock is not more than 3-7/8" wide. 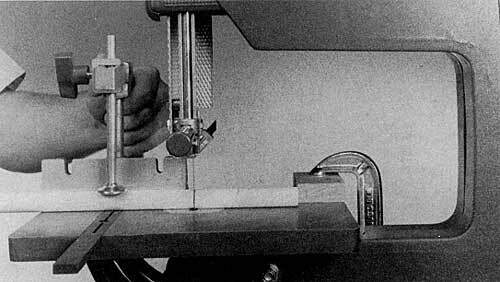 However, when the blade is offset, you must crosscut without the miter gauge. Figure 14-15. Lock the miter gauge with an extension attached in the table slot that runs perpendicular to the flat of the blade, and use it as a rip fence for ripping operations. By locking the miter gauge in the table slot that runs perpendicular to the flat of the blade, you can use the miter gauge as a rip fence (Figure 14-15). Secure the miter gauge in the slot by turning the Allen screw in the center of the miter gauge bar clockwise. This presses the sides of the bar out against the sides of the slot. We also suggest you put a single thickness of paper in the table slot near the miter bar locking screw, as an extra precaution to keep the miter gauge from shifting during ripping operations. Figure 14-16. (A) A standard miter gauge extension makes a useful fence for average ripping operations. The locking miter gauge is what makes this and similar setups possible. (B) A longer extension provides more support when ripping extra-long workpieces. (C) A higher extension provides needed support for resawing operations. If you need more support for the workpiece, attach a miter gauge extension to the miter gauge. The standard extension, mounted on the miter gauge (Figure 14-16A), is suitable for normal ripping operations. A longer extension (Figure 14-16B) provides needed support when handling long stock, while a higher extension (Figure 14-16C) will help you work more accurately when doing resawing. 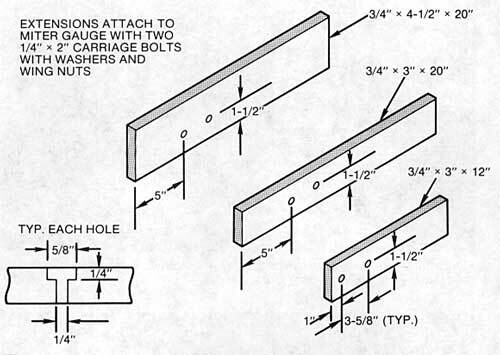 The sizes of all three extensions and the mounting holes they need are detailed in Figure 14-17. You may also want to use a roller stand or the Mark V table and rip fence to help support the workpiece on either the infeed or outfeed side of the bandsaw. Figure 14-17. 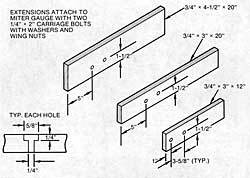 Construction details of three miter gauge extensions. Click on image for larger view. When you're using the miter gauge as a rip fence, pay particular attention to blade lead-the tendency of the blade to drift off the cutting line in one direction. To correct blade lead, first try readjusting the blade guides or angling the miter gauge slightly. If this doesn't work, refer to the Bandsaw Owners Manual to correct blade lead. If after trying both of these remedies blade lead remains a problem, slow down the feed and give the blade more time to make the cut and stay straight. Figure 14-18. Ripping will be accurate if you feed at a reasonable speed and keep the workpiece against the miter gauge extension. Ripping against an extension will be a problem if the blade has lead. When ripping, feed the stock very slowly and be sure to maintain the extension-to-work contact throughout the pass. You can use your hands as shown in Figure 14-18; or, if there is enough room between the extension and the blade, use your left hand on the extension much as if you were doing a rip cut on the table saw. But, in any case, be sure to keep a push stick handy during ripping operations and use it to feed the stock during the last few inches. Also, if you force the cut, it is likely that the stock will move away from the fence or the blade will wander off the cutline. Extension-guided ripping won't work if the blade has lead. You must eliminate the lead, change to another blade, or make the cut freehand. On a few operations, such as sawing or ripping thick stock with a thin blade, it may be necessary to increase the blade tension slightly beyond the normal setting. However, this increased tension will shorten the life of your blade. Always remember to reset the tension screw when you no longer need the extra tension. If accuracy is not critical or the blade is showing excessive lead, you can also make rip cuts freehand. Just remember not to work with pieces so small that they bring your fingers inside the danger zone. Use a push stick instead. 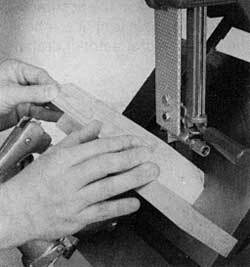 Resawing thick stock into thin boards is one of the bandsaw's most useful functions. This operation cannot be performed efficiently on any other home workshop power tool. To get a good resaw, first joint the bottom edge of the stock. Also make sure the surface that will rest against the extension is as smooth and flat as possible. If the board is cupped, the cup should face the extension. Check the squareness of the table to the blade and adjust it, if necessary- just 1� to 2� out of square will make the resawn board noticeably uneven. Figure 14-19. 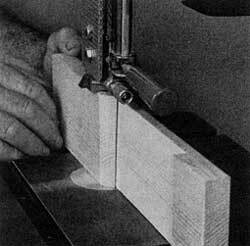 Use a high miter gauge extension when resawing. Feed the workpiece very slowly, especially if you are using a blade that is less than 1/2" wide. Narrower blades can be used, but they are more likely to "bow" in the cut. Since resawing usually involves stock several inches thick and many feet long, it's a good idea to use a long, high miter gauge extension. Clamp a feather board to the table to help hold the stock up on edge and flat against the extension. Use a push block to move the stock (Figure 14-19). Place the miter gauge in the table slot that runs perpendicular to the flat of the blade, and lock it in place so that the fence is 1/32" to 1/16" farther away from the blade than the desired thickness of the resawn board. (This extra distance will give you room to surface the wood after it's been resawn.) 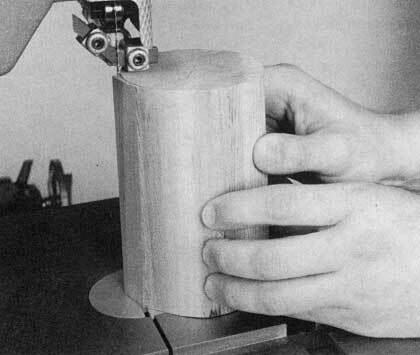 Also clamp the feather board to the bandsaw table so that it will press against the stock just in front of the blade. Always use a push stick to finish a resawing cut. If you're using a 1/4" blade for this operation, increase the tension to the 3/8" mark on the blade tension scale. Figure 14-20. 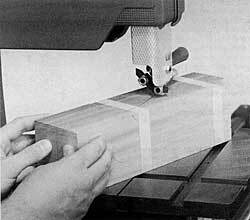 You can prepare a workpiece for resawing by making table saw cuts. The kerfs help to buide the blade and they reduce the amount of materials on which the blade must work. As you make the cut, hold the workpiece firmly against the extension. Take your time and don't rush the cut. If you rush, the blade may follow the annual rings in the wood, giving you an uneven cut. As with ripping, blade lead can also ruin your cut. If the blade tends to wander, even when you feed the stock slowly, readjust the blade guides or the angles of the miter gauge. If this doesn't work, refer to the Bandsaw Owners Manual to correct blade lead. If none of these remedies correct the problem, use another blade for resawing. Figure 14-21. The bandsaw's impressive depth of cut can be utilized to cut square stock round or prepare stock for lathe turning. Small circles require a narrow blade, so feed very carefully to keep the blade from bowing. Many woodworkers prepare stock for resawing by first kerfing the material on the table saw as shown in Figure 14-20. The kerfs do double-duty; they act as a guide for the bandsaw blade and they reduce the amount of material through which the blade must cut. 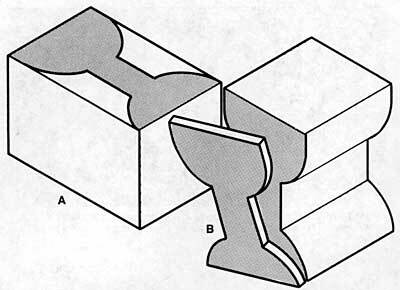 It isn't resawing, in the strict sense, but the bandsaw's ability to cut through thick stock can be utilized to cut square stock round or prepare material for lathe turning (Figure 14-21). 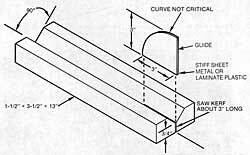 Cutting stock this way considerably reduces the amount of waste that must be cut away with lathe chisels. Figure 14-22. Thinning out stock so it can be bent is a type of resawing. How much of the sotck's thickness you leave depends on how sharp a bend you must make. Thinning Out-Thinning out is a type of resawing procedure that is used to reduce the thickness of stock in particular areas so the material will be easy to bend. Mark the section to be thinned on one edge of the stock. The section should be 1" or so longer than the bend you plan. Make the two end cuts first. Then, starting from any point between them, make an oblique approach to the straight line and continue the pass until it meets the first cut. Turn the stock end-for-end and complete the cut (Figure 14-22). 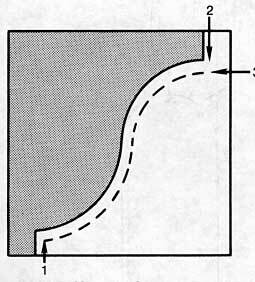 Figure 14-23 shows an example of the kind of bending that can be done by using the thinning-out method. The thickness of the material that will be left after the cutting will depend on how sharp the bend must be. 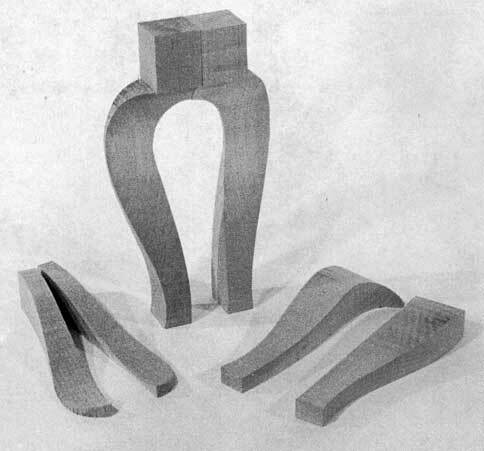 Bends made this way should, be reinforced with glue blocks. Figure 14-23. An example of how stock can be bent after it is thinned out. The thinned sections will be weak and should be reinforced with glue blocks. Figure 14-24. The miter gauge can be used to guide and support the stock when making bevel cuts. To make bevel cuts, simply tilt the table to the desired angle and secure the tilt lock. If the accuracy of the cutting angle is critical, check the tilt with a protractor or drafting triangle. You can make bevel cuts freehand, or you can use the miter gauge to guide and support the stock. After the table is adjusted to the proper tilt, lock the miter gauge in the table slot that runs perpendicular to the flat of the blade, so that the miter gauge is on the right or downhill side of the blade facing up. This will keep the stock from sliding down the table while mak-ing the cut (Figure 14-24). Adjust the upper blade guide so that it's as close to the stock as possible. The left or uphill side of the stock should barely clear the left guide block. Figure 14-25. 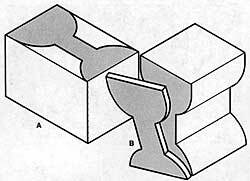 This is how to use the V-block arrangement to cut chamfers. The table tilt will determine the angle of the chamfer. The miter gauge with an extension supports the stock. As you cut, hold the stock firmly on the table and against the miter gauge. If you're making this cut freehand, be careful not to let the stock slip downhill. This will put side pressure on the blade, making it hard for you to follow the pattern line and possibly bogging down the bandsaw. Use the same setup for cutting triangular glue blocks or for forming chamfers (Figure 14-25). The angle of the chamfer is determined by how much you tilt the table. Figure 14-26. A tilted table and a miter gauge with an extension create a perfect V-block. Always place the miter gauge so it is on the down side of the table. Cutting round stock requires extra caution because its shape makes the workpiece difficult to hold. Warning: The teeth of the blade can catch the stock, spinning it out of your hands, or worse, dragging your hands into the blade. 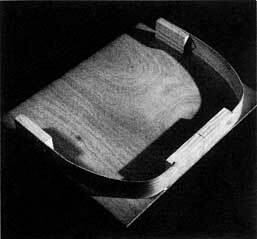 For this reason, round stock should always be supported and guided with the miter gauge or a V-block. Figure 14-27. 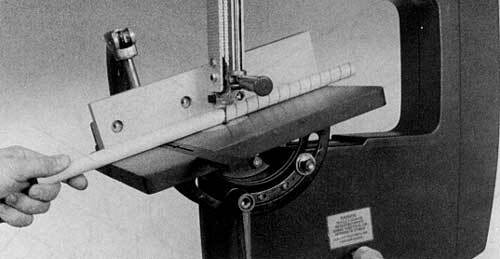 Use the miter gauge to corsscut round stock. By attaching a stop block to the left side of the table, you can accurately cut duplicate lengths. If you're ripping a round piece, such as a lathe turning, use the miter gauge with an extension locked in a tilted table to form a "V" (Figure 14-26). When cross-cutting round stock, use the miter gauge to push the stock into the blade. Hold the stock firmly while you're working. By clamping a stop block to the left side of the table, you can cut duplicate lengths of dowel. Make sure the back edge of the stop block does not extend beyond the front edge of the blade (Figure 14-27). Warning: Be careful when making the cut because the blade guide must be raised to accommodate the miter gauge face. This exposes the blade. Figure 14-28. When cutting spiral grooves in dowels and rounds, the table tilt determines the "pitch" of the spiral and the miter gauge determines the depth of cut. 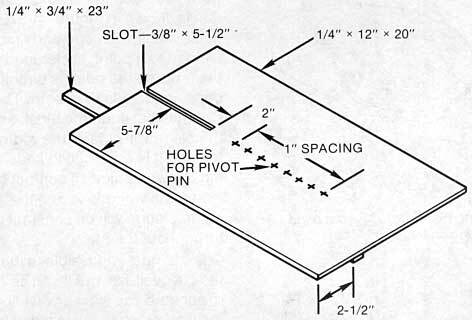 Figure 14-28 demonstrates a setup that can be used to form spiral grooves in dowels or larger rounds. The spiraling can be done on dowels before they are cut into lengths for use in glue joints, or it may be done just for decorative purposes. Tilt the table from 10� to 20� depending on the "pitch" you want, and lock the miter gauge in position to control the depth of cut. Slowly rotate the dowel to make the cut. This is a good way to mark stock for spirals that you handshape on the lathe. Figure 14-29. Construction details of a special V-block. Click on image for larger view. Special V-Block-If you make a special V-block, you can use the bandsaw to accurately form half-round or quarter-round moldings from dowel, rounds, or from pieces that you have shaped on the lathe. Figure 14-29 shows how to make the V-block. The V-block guide that rides in the kerf keeps the stock aligned throughout the pass (Figure 14-30). Be sure to saw the kerf exactly on the centerline of the V. Position the V-block by moving it past the blade and then installing the guide. If the guide isn't a tight fit, use a C-clamp at the base of the block to close the kerf about the guide. Make certain to clamp the V-block so it is parallel to the edge of the table (Figure 14-31). Figure 14-30. The guide rides in the kerf and keeps the stock perfectly aligned throughout the pass. Figure 14-31. Be sure the V-block is clamped in a position that is parallel to the table's edge. Lathe-turned pieces, as well as simple rounds, can be halved, even quartered. Figure 14-32. 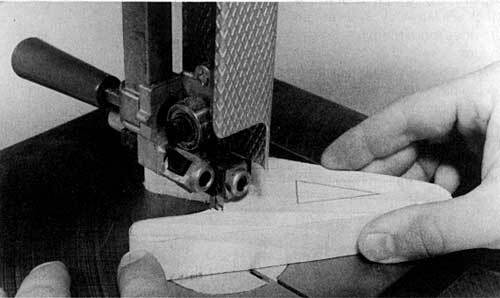 To resaw duplicates: (A) Draw the pattern on a thick piece of stock. (B) Cut out the shape and then resaw it to make the duplicates. Because the bandsaw cuts easily through thick stock, it's possible to preshape a block of wood and then resaw it into separate pieces that will be duplicates of the original design. The shape of the piece that is needed is drawn on one surface of the thick stock. The shape is then cut out on the bansaw. The shaped piece is then resawn (Figure 14-32). Follow the procedures for "Resawing" earlier in this chapter. It's generally a good idea to leave enough extra stock so that you can sand the resawn pieces smooth. Figure 14-33. 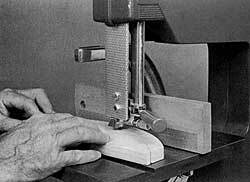 Pad sawing is another way to produce many similar pieces. The pad of individual pieces is held together with nails or with tape. Pad sawing is another way to quickly and accurately produce multiple pieces that have the same shape. The technique consists of holding together a pad of separate pieces, either by driving nails in waste areas or by using enough double-sided tape to do the job. 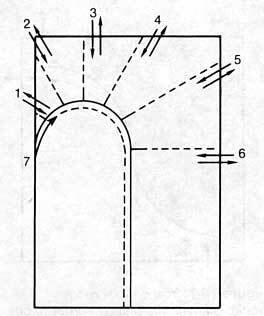 The pattern of the part you need is drawn on the op piece of stock (Figure 14-33). 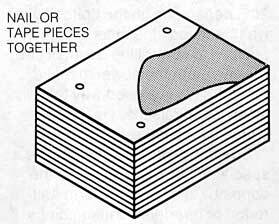 The pad is then cut as if it were a solid block of wood (Figure 14-34). After cutting, the parts separate into individual pieces, all of them exactly alike. Figure 14-34. The pad is cut as if it were a solid block of wood. Figure 14-35. This is the setup to use for doing patten sawing. The front edge of the guide block can be straight or round depending on the shape of the workpiece you will be cutting. Click image for larger view. 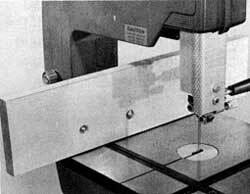 Pattern sawing is a method of working so that a pattern, shaped like the part that is needed, can be used as a guide to cut duplicate pieces. This eliminates the need to do layout on individual pieces and assures exact duplication. The technique is detailed in Figure 14-35. 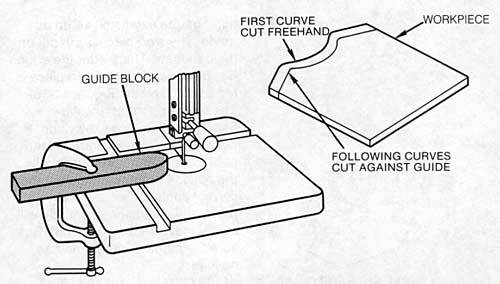 The guide block, clamped to the table, is undercut at one end to permit passage of the material being cut and is notched to accommodate the blade's width and thickness. The workpiece, cut to rough size and shape, is held to the underside of the pattern with short brads that protrude from the pattern just enough to catch the workpiece. 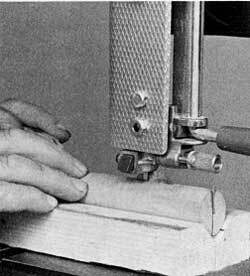 Sawing is done by guiding the pattern along the edge of the guide block. Since the blade is positioned by the notch in the guide block, the work is automatically cut to the shape of the pattern. Figure 14-36. This is the setup to use for doing patten sawing. The front edge of the guide block can be straight or round depending on the shape of the workpiece you will be cutting. Some duplicate curve cutting can be accomplished by using the miter gauge extension setup as a guide. The workpiece is cut out on the bandsaw. Then, after the edge has been sanded, the workpiece is fed past the blade (Figure 14-36). The most important rules are: Feed the workpiece slowly and keep the arc of the workpiece tangent to the extension all through the pass. If you don't maintain the correct contact between workpiece and extension, the blade will surely move off the line of cut. Be sure the blade is sharp and has no lead. Figure 14-37. Irregular parallel curve cutting can be accomplished this way. Be sure the first cut that you do freehand is sanded smooth. Click image for larger view. 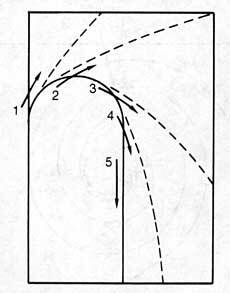 You can't work with an extension if the workpiece has an irregular or reverse curve. For such work you need the arrangement that is shown in Figure 14-37. The guide block, with one end smoothly sanded to a point, is clamped to the table so the point is directly opposite the blade's teeth. The distance between the block and the blade will control the width of the cut. It is essential to keep turning the workpiece so contact between the workpiece and the guide's edge will be constant throughout the pass. It is almost impossible to make the cut oversize, but it can be narrower than you want if you allow the workpiece to move away from the guide. You can use these techniques successfully if you handle the work carefully and don't try to hurry the cutting. Figure 14-38. Construcion details of a pivot sawing fixture. 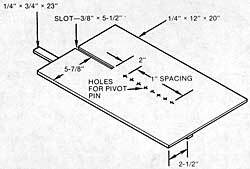 You can cut circles on the bandsaw the same way you would cut any curved line; but if you wish to automatically gauge the cut or need many similar pieces, a pivot fixture can be used. One that you can make is detailed in Figure 14-38. It is important that the fixture be situated so the pivot point is directly on line with the tips of the blade's teeth and that the blade be sharp and free of lead. Figure 14-39. Using the pivot sawing fixture to cut a circle. Take it very easy when you start the pass to give the blade a chance to get into the cut. The best way to work is to first cut the piece or pieces square with a side-length to match the diameter of the circle you need. Hold the workpiece against the blade as you press it down on the pivot point. When you start the blade turning, it will crowd the workpiece a bit, so you must be careful to allow the blade to work into the stock. 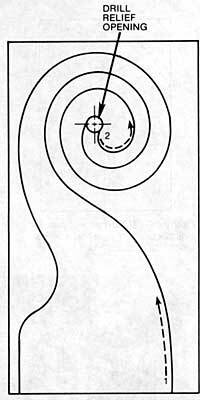 After that it's just a question of rotating the workpiece to complete the pass (Figure 14-39). Figure 14-40. 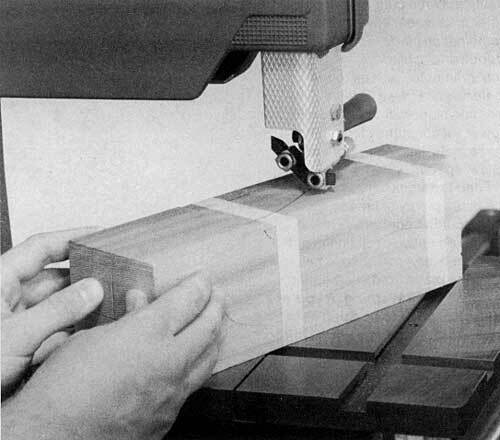 The classic cabriole let is shaped by doing compound cutting, a technique that belongs almost exclusively to the bandsaw. By cutting the pattern in more than one side of the workpiece-compound cutting-you can make the stock appear to curve through three dimensions, as if you had carved it. This is an intriguing bandsaw technique that's useful on a wide variety of projects. You can use it to remove stock and simplify your lathe work, make cabriole legs for tables and chairs (Figure 14-40), or do "bandsaw sculpture"-animal shapes, patterned posts and rails, fascinating lamp bases (Figure 14-41). Figure 14-41. Unusual lamp bases can be made using the compound cutting technique. Figure 14-42. When doing the layout for compound cutting, the pattern must be marked on adjacent sides of the workpiece. The sketch in Figure 14-42 is a simplified version of how stock should be marked to prepare it for compound cutting. A pattern is used to mark the stock on two adjacent faces. 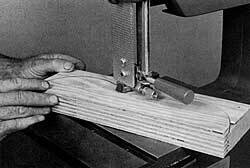 The stock is bandsawed by following the pattern on one side of the stock. Then the waste pieces are put back in their original positions either by tack-nailing or by using masking tape. 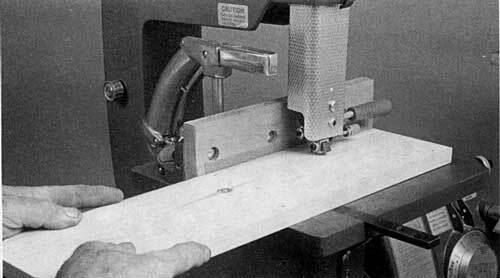 Then the workpiece is bandsawed on the second side (Figure 14-43). When the second phase of cutting is complete, the waste pieces fall away to reveal the finished piece. Figure 14-43. Whe waste pieces that fall away after one side of the stock is cut are replaced either by nailing or taping. Then the second side of the workpiece is cut. Figure 14-44. Don't be too hasty in discarding the waste pieces that result from compound cutting. They might come in handy on some future project. Don't be too quick to discard the waste pieces. Some of them, as shown in Figure 14-44, end up themselves as interesting pieces that can be utilized on other projects. As mentioned earlier, your bandsaw will also cut materials other than solid wood and plywood. These include particle board, plastic, plastic laminates, and soft, nonferrous metals such as brass, copper, and aluminum. Warning: Before cutting metals, clean sawdust out of the bandsaw because hot pieces of metal could ignite sawdust. Also remember that particle board releases toxic formaldehyde gas when cut. When cutting particle board, always work in a well-ventilated room. Caution: When cutting materials other than wood, always use a combination blade. You can ruin a woodworking blade immediately if you attempt to use iton tough materials like these. Even a combination blade will dull rapidly if you use it constantly for cutting these materials. Also, work at 'Slow' speed. Figure 14-45. When cutting metal, apply oil to the cutting line to help keep the blade from overheating. Feed the stock very slowly-give the blade plenty of time to cut. When cutting nonferrous metal, put a drop or two of oil on the pattern line every inch or so to help keep the blade from overheating (Figure 14-45). Warning: If you're cutting round stock, such as pipe, hold it securely with a miter gauge or V-block to help prevent the teeth from catching it and spinning It out of your hands. Caution: When you're finished cutting particle board, plastics, or metals, remove the bandsaw cover and clean the tires thoroughly with a stiff bristle brush. If you don't, the filings and chips will become imbedded in the tires and damage them. Also clean the blade.